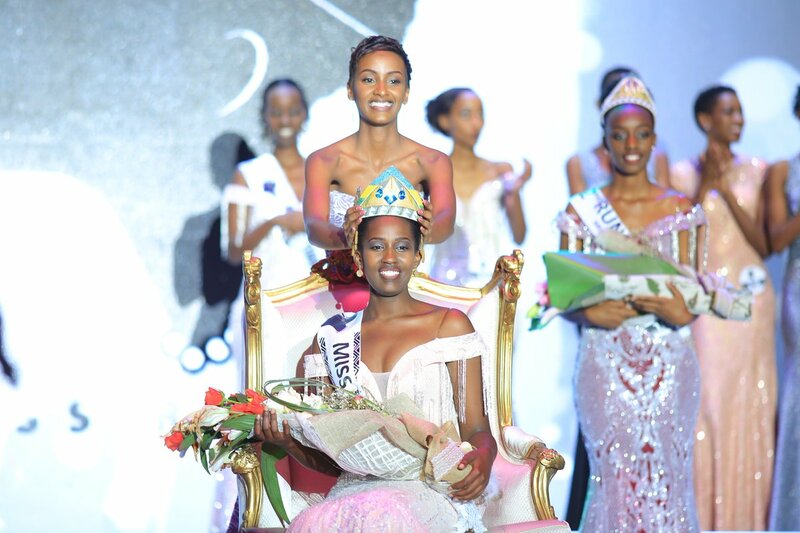 Meghan Nimwiza was crowned Miss Rwanda 2019, replacing Lilliane Iradukunda. The crown was handed over to Miss Rwanda at Intare Conference Arena in Gasabo District in the capital Kigali. Hard moments and hours of struggling with answering questions in English from a panel of five judges ended this Saturday night with Meghan Nimwiza emerging as the crowned winner of the 2019 Miss Rwanda. She beat other four finalists- Casmir Yasipi Uwihirwe, Anitha Gaju, Odile Sangwa Uwase and Ricca Michaella Kabahenda- who were among the crowds’ favorites but not for judges’ decision which was based on eloquence and content in responses. The beauty pageant competition which started on December 15, 2018 winded up in Kigali at the Intare Conference hall in Rusororo, with 15 contestants from across the country battling for the lucrative crown. Besides the grand prize of a brand new black Suzuki swift, and a monthly Rwf800, 000 salary, the winner of Miss Rwanda 2019, also walked away with a package of goodies. They include: free annual saloon services, sportswear, unlimited internet, garage services and once a week hotel offer among others. “I am grateful for God and my supporters who walked with me through this journey. I will only succeed in my projects with your help. I love you all” Miss Nimwiza said after being crowned by Cogebanque managing Director. Nimwiza who dressed no.32 representing City of Kigali, emphasized her earlier project on youth involvement in agriculture to keep youth busy so as to reduce joblessness, early pregnancies and drugs. In the vibrant crowd, cushioned seats inside a fully packed Intare Conference Arena in Rusororo, it almost overturned and remained cold as participants and viewers realized at Miss Rwanda popular contestant and social media favorite Josiane Mwiseneza didn’t make it through the first round. But announcing the other 2019 winners, Mwiseneza came out as Miss popularity 2019, pretty much of what many viewers had predicted with her big numbers of votes on social media. As some sort of consolation, Casmir Yasipi Uwihirwe become the first runner- up while 2nd runner up was Uwase Sangwa Odille. The contest was judged by a panel of five judges who included, two time Miss Rwanda judge and winner of 2016 pageant Miss Jolly Umutesi, Gilbert Rwabigwi, James Munyaneza, Carine Rusaro, and Francine Uwera Havugimana. Miss Mutesi didn’t have a simple time on social media as observing viewers tossed harsh comments over her attitude towards contestants who could barely get the English questions. “The attitude Miss Jolly is displaying… Uhmm that ain’t it sis” said one Grace Uwera, on Twitter. The lack of clarity in English questions continued with majority of the contestants, compelling judges like Mutesi to repeat the questions in a louder voice over and over again. But Josiane Mwiseneza, whose story of walking over five kilometers to reach the selection venue and injuring her feet on the way, proved to her supporters that she can speak English. On announcing her name in the first session of questions (both in English and Kinyarwanda), the hall went wild in applauses. Mwiseneza, who was dressed in a red sparkling dress didn’t make it through the first elimination round but proved to judges that she had made a full journey that changed her life. Besides English hurdles, Miss Rwanda 2019 event also had some funny moments with an unedited videos in which one of the contestants Anitha Gaju, made grammatical error in her boot camp interview, some having hard time walking in high heels, paper leaf with numbered questions returned into the slot bowl by contestants – forcing judges to request them to pick another number.